Oxford University Press, USA, 9780198745549, 160pp. Hinduism is practised by nearly eighty per cent of India's population, and by some seventy million people outside India. 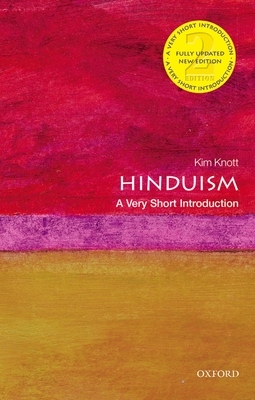 In this Very Short Introduction, Kim Knott offers a succinct and authoritative overview of this major religion, and analyses the challenges facing it in the twenty-first century. She discusses key preoccupations of Hinduism such as the centrality of the Veda as religious texts, the role of Brahmins, gurus, and storytellers in the transmission of divine truths, and the cultural and moral importance of epics such as the Ramayana. In this second edition Knott considers the impact of changes in technology and the flourishing of social media on Hinduism, and looks at the presence of Hinduism in popular culture, considering pieces such as Sita Sings the Blues. She also analyses recent developments in India, and the impact issues such as Hindu nationalism and the politicization of Hinduism have on Hindus worldwide. Kim Knott is Professor of Religious and Secular Studies. Previously at the University of Leeds but now at Lancaster University, she teaches the study of religions, including Hinduism, and researches religious/secular controversies and religion in public life, focusing on the media, conflict and security. She has authored and edited a number of books, including Media Portrayals of Religion and the Secular Sacred (Ashgate 2013) with Elizabeth Poole and Teemu Taira, Diasporas: Concepts, Intersections, Identities (2010) with Sean McLoughlin and The Location of Religion: A Spatial Analysis (2005). She has also produced a website for young people and teachers of Global Education, Citizenship, History and Geography called Moving People, Changing Places.